Every person wants to live in a comfortable place, but each person has his or her own choice of interior design style. Today, computer technology has made it possible for designers to create outstanding and artistic designs through software. In fact, designers can come up with as many realistic designs for any given space to provide clients with as many options as possible. Various 3D design software like Autodesk, 3D Spacer, and Sweet Home 3D make interior designing a lot easier than ever before. With a few clicks of the mouse button, a computer user can turn any conceptualized design into a viewable and navigable model. Though it may sound easy, it requires creativity, design experience, and a lot of talent. Through the use of software, designers can experiment with a variety of color combinations without having to waste a lot of ink and paper. Hence, if you are interested in having your home renovated, a designer can easily show you various designs with different color combinations and furniture setups. Computers today are designed to perfectly fit the modern home. In fact, you can use these gadgets to enhance your home's interior by placing them at certain locations of the house. You can have one at your bedside, especially if you want to have privacy whenever you get online. If you work online, you can place a work computer at the living room, study, or any other room you feel conducive for concentration. Thanks to wireless technology, you can connect a computer to a flat screen television and use wireless keyboard and mouse a few feet away from the screen. Now, you can operate the computer at a more comfortable distance. Wireless technology also makes homes look neat and clean because it lessens the use of cables. Place tablets, smart phones and other mobile computer gadgets at designated areas. In fact, you can display all of your mobile devices in one corner. This makes the gadgets look like pieces of home decor, and gives you better access to them whenever you need them as well. Remember that organizing your electronic gadgets makes it easier to find anything you need when you need them. This is also true with remote controls, gaming consoles, and other gizmos. Entertainment is usually a must in many modern homes. Thanks to flat screen technology, interior design becomes easier. Television screens can easily fit on corners and even be mounted on walls. Speakers can be mounted on various sides of the wall to create a 3D sound effect, or simply placed on top of cabinets or other types of furniture. A whole entertainment set can be installed in the living room to provide entertainment for the family and visitors. However, an entire room can be dedicated for entertainment purposes. Entertainment sets can also be used to enhance the interior design of boring bedrooms to make them look more appealing. Aside from the usual home decor, like paintings, fancy furniture and the like, mounted TV screens and speaker sets add additional contrast. 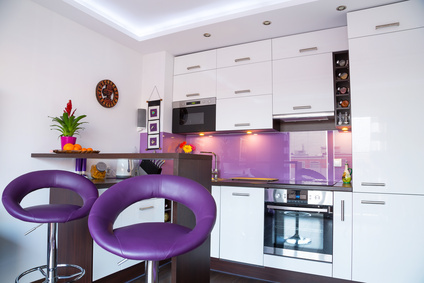 Lastly, lighting is a very important aspect of interior design. When placed at respective positions, lighting can enhance the appearance of home decor, furniture, art, electronic gadgets, and the like. Thankfully, modern designers can easily create computer simulations to experiment with different combinations of lighting. There are different types of lighting fixture you can use in your modern home. You can use dimmer switches to control the intensity of light that each fixture emits. Lighting can also be switched on and off automatically, or controlled using a remote. With 3D computer technology, designers can experiment with specific types of lighting to determine which lighting combinations work for your home. Modern technology really provides modern homes with various enhancements. Computers, television screens, speakers, mobile devices, lighting, and the like can add variety to interior design. Unlike some types of home decor, they have other more useful functions.